Inez van Lamsweerde and Vinoodh Matadin’s work has graced the walls and pages of some of the world’s finest galleries and fashion magazines, and if it is surprising that their photographs easily float between these worlds, it is by virtue of their ease in creating imagery that seeks homes in both culturally elite and mainstream outlets. For some of their photographs, such as their portrait of Björk or campaign for Givenchy, van Lamsweerde and Matadin have worked in collaboration with the art directors M/M (Paris), who have also designed this retrospective that looks back at "pretty much everything" that the photographers have been working on for over two decades and that has brought them to the forefront in the fields of both art and fashion. 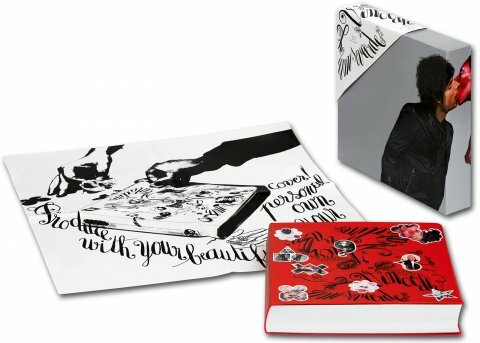 This standard TASCHEN edition—an affordable version adapted from the limited edition—comes with a sheet of stickers so you can personalize your cover!